About a year ago, Brooke told me that she was going to tell me a secret. I bent down and leaned in close. She put her cheek next to mine. I waited. I eventually asked if she had something to tell me. She said, ‘Yes, a secret.’ So I waited some more. About six months ago, Brooke told me that she was going to tell me a secret. I bent down and leaned in close. I cupped my hands around my ear and told her to say the secret into my hands. She put her ear on them too. And we both waited. Just like that. Ear to ear. This morning, Brooke said, ‘I’m going to tell you a secret’. Don’t know what shosojas are. Last night, we celebrated my birthday. 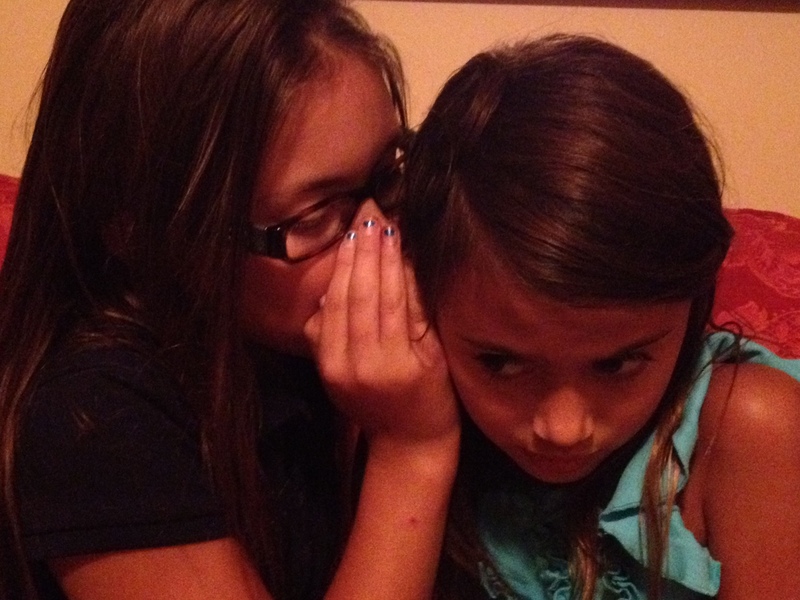 Throughout the evening, Katie would periodically whisper into her sister’s ear. Just a little secret between sisters. Apparently, they are the very best kept secrets in the whole wide world. I love those kids! Happy Birthday Jess, Thank you for everything you do! I wasn’t correcting your spelling. I was guessing if that’s what she might have meant. That’s beautiful!! Once again, the things that seem small, and many people just take for granted, are NOT small, and never taken for granted by ASD families! I LOVE this. Just awesome! my son does the exact same thing and i love it. i homeschool him so i am always having to correct his behavior. i can’t seem to get myself to correct that one. i find it endearing and disarming, probably for the reason you just mentioned. Sooooooo awesome. And something important, too, to respect the growth and that it comes on its own timetable. Happy Birthday to you! And it’s clearly no secret you had a great one!! Love this post and it is truly an evolution, one of many! Wishing that all your birthday wishes come true!! I assumed it’s sausages. Happy Birthday Jess! And, secrets, what a huge deal. Love it. Happy Birthday. Sounds like it’s a great one so far. And tell Katie she looks great in her glasses. Very cool. Best secret I ever heard! Awesome!! I can’t wait for my baby girl to tell me a secret! 🙂 & Happy Birthday Jess!! So much beauty in a secret! What a wonderful birthday gift! sharing a secret- to some a meaningless exchange- to us its a miracle years and years in the making. Truly amazing. HAPPY BIRTHDAY! Hope it’s a year filled with secrets told and secrets kept. Happy birthday! Every “little” thing is so BIG! i’ve found that is the best gift our kids give us. we have learned to find joy in these small moments. i’ll echo the other sentiments and say what a fabulous birthday gift! Where did these perfect little beings COME from? I love these stories so much but not as much as that picture of your girls sharing secrets. So stinking cute. I love the picture too! I missed this post the first time around going back to catch up but Happy Birthday even if it is belated. My David has a word that mean everybody to him it’s goiys I think it must be his blend of boys and girls I never correct him on it because it makes sense, if only it would catch on then everybody would know what he means.